I am a self confessed WordPress theme junkie and buying a new theme for a website is like buying new clothes for me. I need to have the absolute best WordPress theme for my websites in order for them to have fast loading times and deliver a pleasant experience for my website visitors. Over the years I have tried many WordPress themes and I have a huge collection of predecessors stored on a secure backup device. You see some were a purchased on a whim, while others were planned and cherished, but eventually most were outgrown by technology. I actually started out using Microsoft Frontpage which seems extremely primitive compared to what I’m using today, the WordPress content management system, coupled with WordPress themes and plug-ins. Life is easy for me today, when it comes to building a website, but the hard choice now is which WordPress theme to actually choose? I have been using the Thesis WordPress theme for a few years now and you could not tell me that there was anything better available for my websites. I loved the way you could add some code to the custom functions file, along with CSS to style and come up with something awesome. By using Thesis I learned how to create code that replaced the usual plugins I needed. For example in my Thesis theme I added code for the related posts, the author box, the social buttons, and so much more. That meant my site had less plugins and more functions. You could call me a Thesis fan. Recently I bought Genesis 2.0 and after a quick analysis, I have come to some obvious but sad conclusions. I feel bad about jumping ship, but the facts are here for you to see. Genesis has an awesome design straight up. Basic but not clunky and obvious like Thesis. I was amazed that I did not really need an added child theme straight away, but of course I added one anyway. Check out the screen shots below of the raw framework. Another great thing about Genesis is that if you install a child theme and customize it, the actual frame work is unchanged and safe from your human errors. Then you can backup your child theme and use the same customizations on other sites. (If your license permits) The actual framework stays clean. Genesis came with an awesome design so for starters there was a far less customisation needed. When I have changed WordPress themes previously, there is always approximately 2 hours of work to get the website back to what I needed. You know, all of the essentials. Genesis 2 came with many features inbuilt so as soon as I installed it, there was a decent looking functional website showing up. A common customization is to change how many columnists your website has. In Thesis 1x it was relatively easy to change how many columns you had and the width of them, but Thesis 2 became harder. On the other hand Genesis was even easier! In Thesis 2 if you wanted to customize your layout you would have to deal with boxes and css which is not always easy. I would rather click on my choice and be done with it! Genesis 2.0 has been designed to deliver even better performance and it is what has been taken car of under the hood that counts. Support for HTML5 and schema.org markup. The HTML5 markup makes your site truly mobile-friendly. I have tried to work with Thesis 2 but I was hitting road blocks, and far too many for my liking. I found myself wasting time just trying to get to know how to use this new framework. Don’t get me wrong though, it is an awesome framework but it turned out to be too technical for me. I could have taken the time to work it out, but time is money from me, and it also means less updates on my website. I need to create content and promote it, not design my own websites from scratch. One of the reasons I decided to change WordPress themes is that some of my sites had slow loading times. I noticed that people were bragging about having a fast loading website and I was obviously jealous! See my friend Ana’s site, Traffic Generation Cafe. That is one site to be jealous of! Ana recently defected from Thesis to Genesis. When I installed Genesis on this site (I had a Themforest theme installed at the time), my page loading time went from 58 to 79, without any customization and tweaking. Then after optimizing images on my website the score has gone to 84. I have a few more things I can optimize to gain an even better score. I haven’t yet changed one of my Thesis sites to Genesis but Ana is very excited about how fast her site is loading and I agree, it is definitely faster. I was in love with Thesis 1 and I mean love. I spent years playing with it and I genuinely could see the potential for Thesis 2 but had no time to go that in-depth. 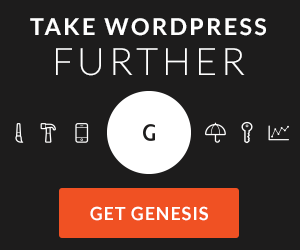 When I installed the Genesis 2.0 Framework, within the first hour I knew that this WordPress theme was amazing! If you are worried about changing WordPress themes, see my 39 point checklist for changing a WordPress theme. It even tells you how to import Thesis SEO details into Genesis. I have to admit…I too am a theme fanatic. I have purchased so many themes in the past. I was going to pick up the Thesis a while back. However, I ended up going with the Woo Themes. I have heard a lot of great things about the Genesis themes. I have personally never used it. Your site does load extremely fast though. It looks great too. Oh thanks Susan! I am trying very hard to keep it very simple and fast but when you start adding things its gets a bit crazy. I got my speed score to 85 on some pages and then back down again a few points. Need to weigh up what I really need? 🙂 Hard choices though. Well i personally recommend to use genesis as it’s themes are really awesome and with clean design. It comes with impressive speed and other things which we can’t deny using it. But thesis is also great but never used it though. Thank you for your candid thoughts on Thesis vs. Genesis. I couldn’t spare the time to figure out Thesis 2.0 so had someone from Elance take on the project of updating a couple of my business sites using Thesis 2.0. Now I’m afraid of going too deep with any changes as I might mess it up! Because Genesis works in a parent/child framework it can be a bit confusing to work with, but I believe the benefits are well worth the extra effort. Hang in there, you’ll be fine! BTW, we use the same paid plugin Ana does for adding the Schema.org markup. It does a great job. Your site loads faster than it did before.Genesis seems to be a very powerful framework , i have seen many popular blogs using this framework and am tempted to uses this framework for my blog too .Thanks for sharing the information . It really depends what your website is about and what your trying to accomplish with your site, Ive used thesis and I LOVE the custom ability’s it offers, however genesis ive never used so cant really comment on. Which is why this is really a broad thing to discuss. Thesis is still great but when they went to 2.0 it changed the game for me. Yes it is innovative but so is Genesis 2 and it is just easier to learn. Thesis could turn to be the better one but I do not have time to get that in-depth. Great to see that you have switched over to Genesis too! I agree that Ana’s site is super fast and yours seems faster too. Thanks for the head-to-head match up! It is very different to Thesis but I slapped this site up within minutes and I am planning to keep it simple. I will add some social sharing buttons, but just working out the best way to do it manually..
Ana’s site is looking great and it’s fast! She made me jealous so it is all he fault! Mi Muba recently posted..How to organize a tableau show to raise environmental awareness? It is always good to try stuffs ( I recently made a comment on one of your post and stated that you have changed your theme, was actually asking for any noticeable SEO benefits). I am totally revamping my website to run on Genesis and plan to have it hosted on websynthesis; I think there are lots of SEO benefits associated with the use of Studiopress themes ( going by the recommendation of yoast). Have you noticed any positive spike in organic traffic? I expect to see a spike in everything because of the simple design and the speed. I have taken the newest child theme that works with the new Genesis 2.0, eleven40. Not sure if that has made a difference because I am new to Genesis. I was thinking of moving to either WPengine or Websynthesis but I am getting good scores straight up on my Hostgator dedicated server and I am yet to go and tweak the settings there. I am told there are tools to enable for more speed and performance. So overall I am impressed and will just see if I can do a few more things to improve.